Numerous storms hit the park in the last couple of days providing heavy rain and high winds. On Tuesday morning 8/28 a tree near Bunker Hill was struck by lightning and came down on a Charter/Spectrum fiber line which knocked out internet for the entire park and surrounding areas. The line was repaired and back up and running shortly after noon. We highly recommend recycling power on on all electronic devices, specifically modems, routers, computers and televisions after the system reset to establish a good signal connection. Tuesday night another band of storms hit the park with stronger wind gusts bringing down a handful of trees, limbs and saplings. Sandy Pines Maintenance Crews have been working diligently to clean up impacted areas. 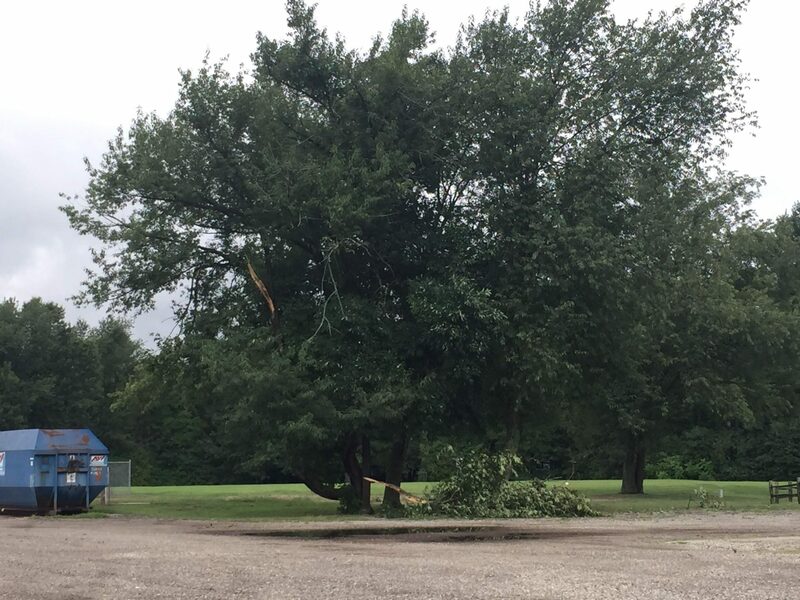 Public Safety Officers have been patrolling the park and contacting members impacted by downed trees and limbs. Heavy rains caused flooding on the back 9 at Lake Monterey Golf Course. Turf Crews are running pumps on the impacted areas and expect the back 9 to be open for play tomorrow (Thursday 8/30) if all work goes according to plan. Members may take loose or paper bagged leaves and brush to the leaf/brush dump located across the street from the Public Safety Office. Materials are required to be placed in paper bags as plastic is not accepted. Maintenance will pick up leaves along the road in paper bags. Brush must be stacked neatly with the ends toward the road. Thank you to our Maintenance Crew, Public Safety Officers and Golf Course Staff for getting us cleaned up and back into shape! Thank you to all who cleaned up the park after the storm tore through! We were very fortunate it wasn’t worst!